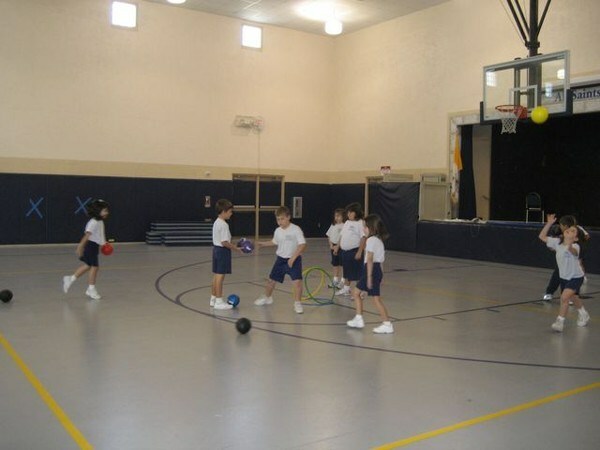 Physical Education and Athletics at All Saints Catholic School are integral components of our students’ overall development. Our activities are developmentally appropriate for the different grade levels and are presented in a manner that allows our students to explore their physical potential, while developing a sense of self-awareness and confidence. The Pre-K through First Grade program allows students to explore movement and introduces them to basic manipulative skills and a sense of fair play. Our Intermediate program introduces different sports-based activities while continuing to develop gross motor skills. Our Middle School program focuses on using the skills developed in past years to explore a variety of team, individual and dual sports. The underlying theme of the program is to teach our students the benefits of a healthy lifestyle and encourage them to find ways to unleash their physical potential.